The simplest things. Like finding out where one is, or the name of the place one wants to be. Never mind governing a country, carrying out a census or collecting taxes. I have a list of villages in two districts in Afghanistan. Actually, I have several different lists of villages. Problem is, they don’t match. The key source of information is the lists from the Afghanistan Information Management Services and the government Central Statistics Office. For the districts I’m in interested in right now, they name about 400 or 500 villages, all neatly displayed with geocodes and GPS points. Problem is, they’re a couple of hundred villages short, and they can hardly get the district borders right let alone an accurate lat and long. Plus, I don’t know if the village listed by the CSO is the same as the village with the same name on one of my other lists. Lets start with what we mean by ‘village’. A settlement, a distinct collection of houses, probably clustered around a mosque and an old donkey, with some vague social and economic ties between the inhabitants and a single shura, perhaps. Or would that be a community? There are differences, but they seem to mean different things to different people. Do several villages form a community, or do several communities make up one village? 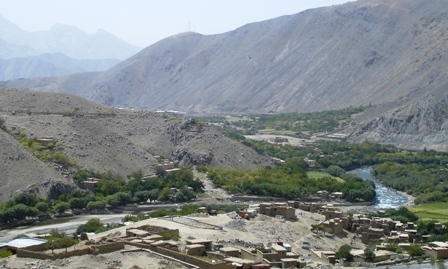 And what about related sub-villages, that little cluster of houses a little walk up the valley where the mullah’s brother moved his family a few years ago? A name, that’s all I want, just a name. But here’s where the fun begins. Translating and transcribing from Farsi to English is always problematic. Koran or Quran, as one basic example; there are some characters that can be changed in different ways, where convention gives the only correct spelling (but is of no use right here). So, I can fairly safely assume that the ‘Sarma Zor’ on one list is the same as ‘Sarmazoor’ on another, but that’s an easy example and you have to be careful. Complication two is the fact that many places have compound names, which aren’t always written down. AIMS data is full of such gems as ‘Sarshar ’ and ‘Sarshar ’. Well, I know there’s a Sarshar Ulia and a Sarshar Sufla – an upper and lower Sarshar – but which is which? I’m guessing the ‘Piyazi’ on one list is the same as the ‘Nili Piaziy,’ but without accurate GPS coordinates I can’t be sure. I’m sorry, I know this is very boring but it’s been driving me crazy and I want to rant. How many villages can you see? Next up is the fact that many places don’t really have a name, least ways not one that’s widely accepted. Or, the name of a place given by the folks living in it is different from the names outsiders know it by. Or the question just gets confused between the name of the village, the name of the community, the name of the shura, or the name of the oldest bloke in the village. I have several groups of places that are named ‘Masjed Obaidullah,’ ‘Masjed Hanifa,’ Masjed Haji Abdul Rahman,’ ‘Masjed Mulla Abdul Rahman,’ ‘Masjed Gul’ and so on – named after the guy that built the local mosque, or in the case of the last one, maybe the pretty rose that’s growing up the side of it. These are usually the names of the small isolated places that have never really had need for a more ‘official’ name. What if there is more than one mosque in a ‘village,’ or ‘community’? I start knocking my head against the table that’s what. Then factor in spelling mistakes, individual idiosyncrasies, and the odd spark of incompetence, and you have a right royal impenetrable mess. I have different lists, written by different people across the years, each containing different bits of information that I need to pull together. Don’t ask me why I need to pull it together, I forgot long ago. But I have an urge to make sense of it. I feel like some colonial administrator, trying to impose a schematic order on the unruly natives, to classify and chart and get these villages to stand in line each with a unique geocode. There’s a good word for all that but I forget. I demand order! I must fit this chaos into a prettily formatted spreadsheet so I can tell you how many men, women, children and chickens are in the village of Zalargak without having to leave my desk. I want satellite tracking devices in each and every one of those scrawny bloody chickens. But there are ethics to this. What if that information got into the wrong hands, and the US started using drones to attack those precisely located chickens? The simplest thing. Knowledge is power, and this kind of boring data is usually pretty important for the chaps in the capital wanting to rule over their minions, or govern. I doesn’t exist in historically decentralised and fragmented Afghanistan. And that’s all just about a ‘village.’ It doesn’t get any easier talking about a household. Or a family. Or a group of families living together in a single compound but not in a sharing system, or two households physically separated but in a sharing system. I would explain the differences but I’d have to start drawing kinship diagrams, and none of us want that.